“People like cats.” That was my thought years ago when I first decided to draw some cat pictures. I’m guessing it was the early 2000s. I had never drawn many cats before, only one I can think of off the top of my head, nor many animals of any stripe but for some vague notion of popularity I decided to draw a few cats. I consider myself a dog person rather than a cat person but I somehow settled on cats to draw. Of course the first thing I did was I went to the internet to look for some photos of cats. As most people know there are a lot of cat photos online. But finding one I could make a drawing from was hard. I’m very picky when it comes to any kind of photo reference. I prefer to shoot my own photo reference so I can get exactly what I want but that’s not always possible. So I end up looking through a thousand cat phots to find a few that were good for me. 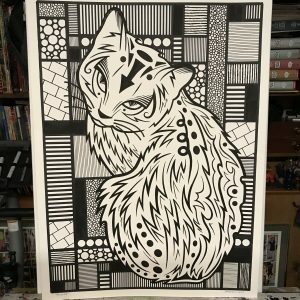 It turns out that the facial structure of a cat suits my stripped down graphic drawing style. The eyes, the mouth, the nose, the ears, and the whiskers all can be broken down into simple and attractive shapes. Drawing a cat’s face that says “Cat’s face” is not too hard. At the right angle with the right shapes it all comes together. Dogs are much harder. They have much more variety in head shapes and sizes. Plus those long noses don’t translate as well into a simple drawing. A cat was the right drawing choice for me. I can remember one of the problems I was having with the cat’s face was the center of its head. The forehead. It tended to be blank and flatten out the face. Any attempt at shading or delineation of fur just muddied the waters. So I ended up putting a symbol on the cat’s forehead. That’s how I got “Arrow Cat”, “Ankh Cat”, and “Infinity Cat.” Since I’m a fan of symbols I think that part worked out fine. 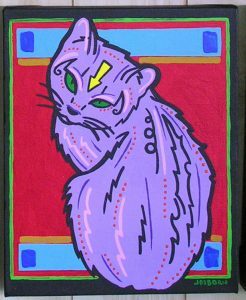 I made the 8×10 inch acrylic on canvas painting of Ankh Cat back when I first started drawing cats. I made him a purple cat. The purple is pretty strong but the red behind him is equally as strong. That gives this painting the feeling of a traffic sign. It seems the cat is trying to warn us about something but I’m not sure what. Emphasizing the rectangular shape of the canvas with the green outline and the blue rectangles makes this even more of a road sign. The dark blue brush strokes bring it back to a painting but I still can picture this as a sign on some remote European mountain. You can see a few different shapes in the fur in this one. There is the basic black line that shapes the whole cat but since this was a painting I didn’t stick with just that. Painting offers the opportunity to use color and texture so that is what I did. 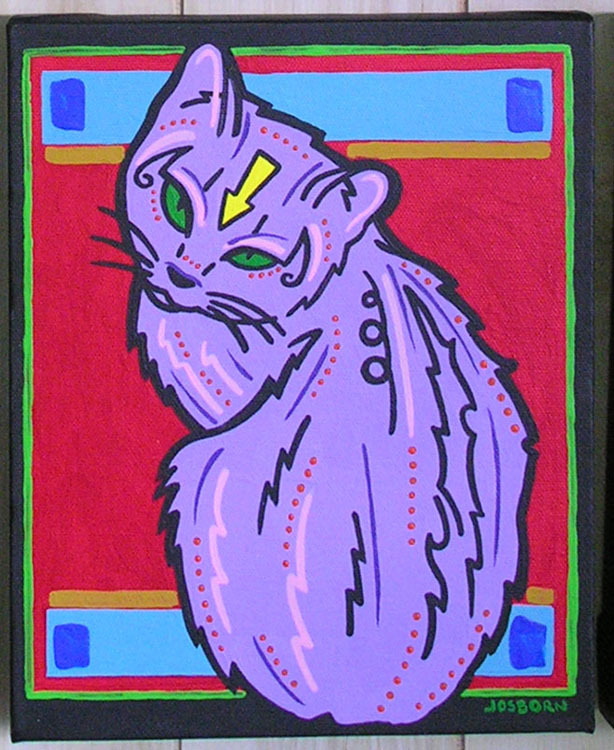 We’ve got light pink strokes, magenta dots, and dark purple strokes all coming into play to make the cat’s fur. It’s a modernist painting approach where the paint isn’t literal but sees itself as paint on canvas. So at the same time we see the cat but know it’s made of paint. Now we’ll fast forward to just a week ago. I was looking through my drawings looking for something to make a big ink drawing out of and guess what though one through my head. 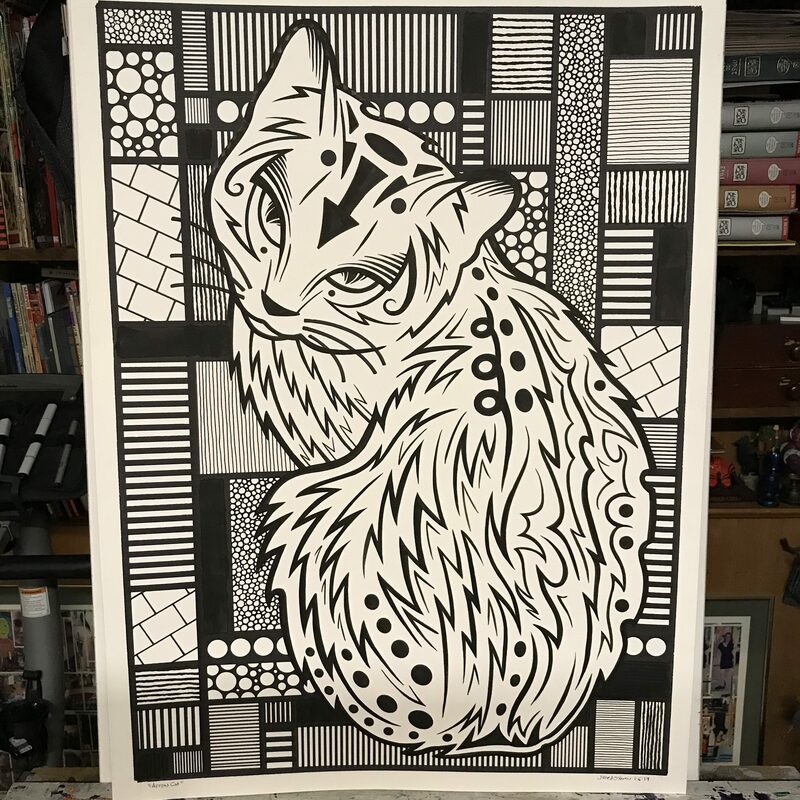 “People like cats.” I scan my stuff as a matter of course so I have all my old drawings and painting scanned in and waiting for me. I did a search for my cat drawings and found good old Arrow Cat. The only thing missing was an idea for the background. The background of the painting was all about painting and that wouldn’t work in a drawing. I contemplated some kind of landscape behind the cat but that didn’t go with the graphic design drawing that I had planned. I even tried out some drawings of faces and such but none of that worked. It only distracted me from the cat. 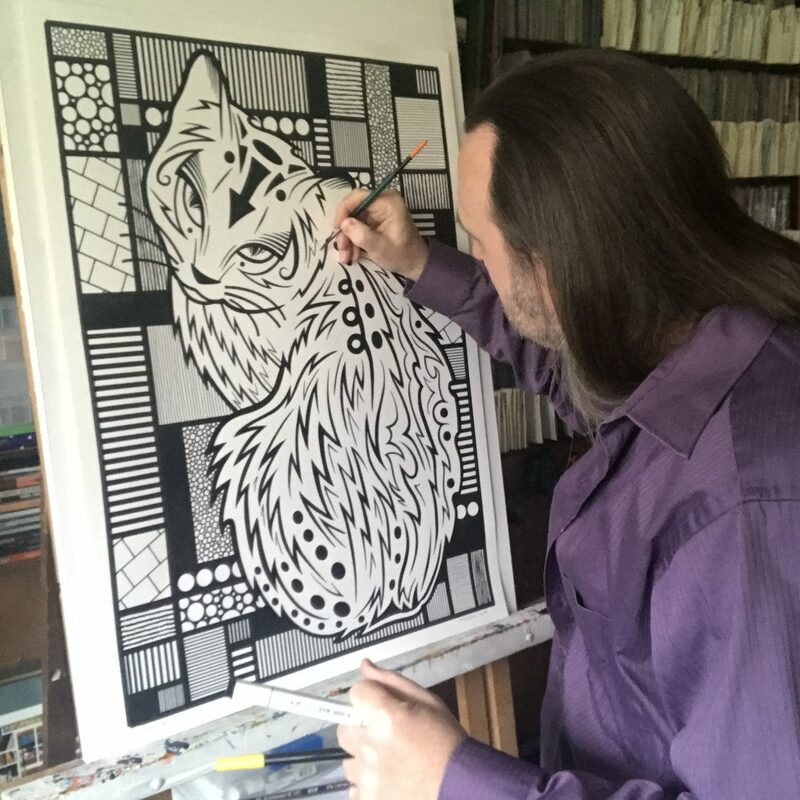 I ended up putting in various Mondrian lines in the background (I was working on the computer) and that seemed to pull it together. I knew the boxes it formed wouldn’t stay blank but I knew I could figure them out later. That’s when I blew up the drawing to full size and transferred it to a 22×30 inch piece of paper. The original drawing had about the same number of lines that you see in the painting. I knew I would need more lines in the fur but once again I would draw them as I went. So after I transferred the drawing I grabbed my brush and ink and started inking what was there. It took a fair amount of time draw the cat in ink. I kept the lines sharp and precise so that meant slow and deliberate. After I finished the first pass there were about half of the amount of lines you see in the finished piece. Then I stepped back to see what other lines were needed. I’s grab the pencil, draw some in, decide if they were correct or not, and then ink them in if they were correct. The fur still wasn’t finished after the second pass but I decided to move onto the back ground. I knew I would need a lot of different textures in the background and that would take some time. It’s amazing that after years of experience I can just see what texture I need next. I’d stare at the background for a few minutes and “Vertical Stripes in the left box” would just come to me. I could picture it in my head before I did it. They come in order too so I can’t picture it all at once but as I go along I can picture the next one. As I worked on the background I also worked on some more of the fur. I’d switch between them. Four or five boxes of texture and then a few marks on the fur. Pretty soon I had the background finished but not the fur. That still had some small touches to go. It takes time for a young artist to learn when something is finished but I haven’t been a young artist in a long time. I can tell when a piece is finished pretty easily. I can look at the cat and see that it’s almost done but not quite there yet. If I look at it closely something will suggest itself. Some line or mark. I look at it until I see there is nothing left to do. Its not even a question. It’s almost done, it’s almost done. It’s almost done, and then “Boom!” It’s done. Somewhere on there I put down one last line and the drawing was done. That’s a good feeling.